The following review evaluates the latest exhibition on display at the Newberry Library. It is free and open to the public from 8:15 am – 7:30 pm on Tuesdays through Thursdays, and from 8:15 am – 5:00 pm on Fridays through Mondays. According to the first didactic panel visitors encounter upon entering the exhibit, the show’s story is about the venerable Goodman Theatre, Chicago’s oldest center for performing arts. It aims to explore “the theatre’s founding within the context of a remarkable heritage of live performance and popular amusement in the city.” This mention of “context” is critical for the exhibition as a whole, as one of its greatest strengths is delving into the intricacies of the Goodman’s founding while not overwhelming the audience with details about just one location. Indeed, the exhibition begins by examining theatres that reigned over the Second City’s entertainment industry decades before the Goodman was even conceived. The first segment of gallery space succeeds in drawing in the visitor. 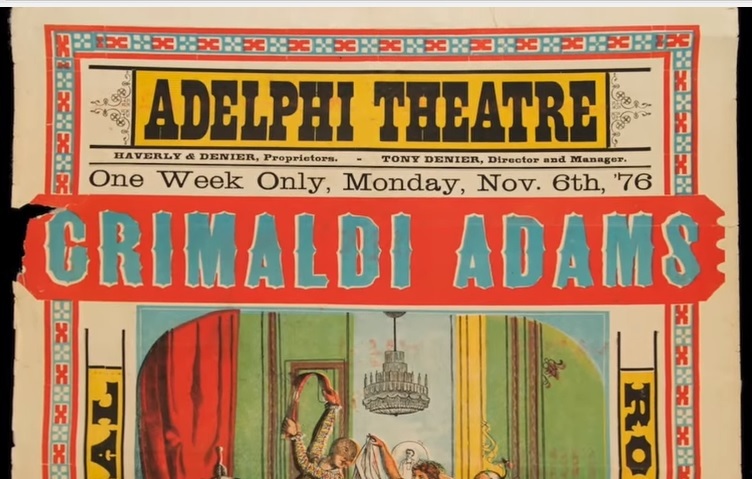 The vibrant posters from places like the Adelphi Theatre and Col. Wood’s Museum (left) are mesmerizing examples of ephemera, and scanning through them could make readers feel like they themselves are late-nineteenth century theater buffs. Before 1871, contemporary plays could amusingly share the stage with more carnivalesque attractions such as the world’s largest lion! Everything changed, though, with the Great Chicago Fire. The conflagration consumed Chicago’s entertainment venues, providing an opportunity for more grandiose theatrical arenas to rise in their wake. 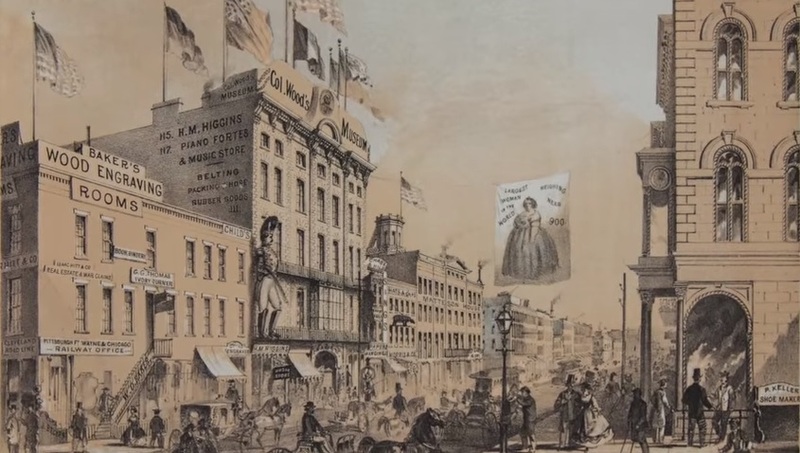 One of the most opulent new venues to emerge in this environment was the Iroquois Theatre. Touting itself as a paragon of flame preparedness, the Iroquois tragically (and ironically) burned to the ground in 1903 in one of the most lethal single-building fires in United States history. Over 600 people perished in the blaze. Including a section on this event provided a somber counterpoint to the exhibit’s overall tone. The exhibition organizers clearly understood the need to emphasize the nuances of Chicago’s burgeoning theatrical market. 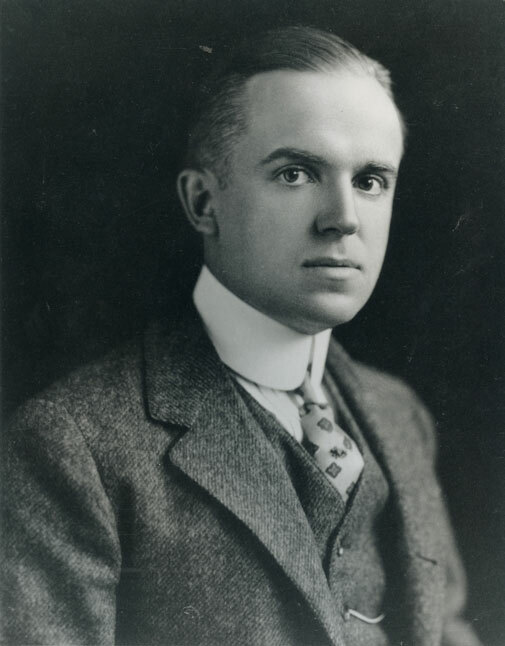 Hence, there is also considerable attention provided for spaces such as the Pekin Theatre, Chicago’s first African American-owned theater company, and little theatres like the Hull House Theatre founded by Jane Addams to promote women’s artistic self-expression. Within all this context, though, it is important to remember that the exhibition’s central focus is still the Goodman Theatre. It begins by examining the life of Kenneth Sawyer Goodman (right), the institution’s namesake. 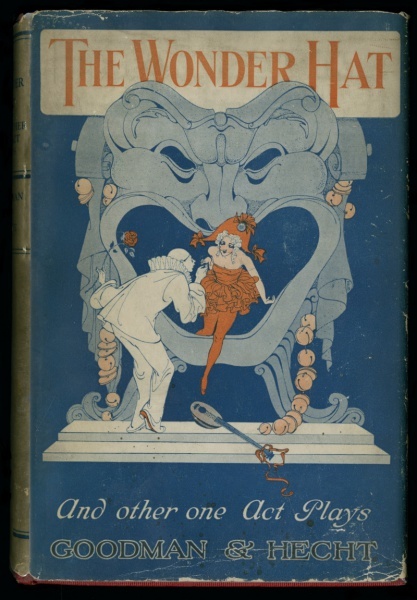 Goodman died at the age of 35 during a widespread influenza epidemic, but before he passed away so young he was positioning himself to become a powerhouse in the world of theater. What most fascinated this reviewer were the artifacts of Goodman’s early life on display, especially all the short stories and illustrations he contributed to his college newspaper. Supplementing the visual vignette on Goodman’s formative years are family photographs and pieces of personal military regalia from World War I. Above all, Goodman was a playwright. The exhibition features beautifully preserved playbills from original Chicago runs of many of his productions (left, for instance). After his untimely death, though, his mogul parents vowed to fulfill his ambitious dream of beginning a Chicago-based repertory company. Affiliated with the Art Institute of Chicago, the goal of the company was to write and perform contemporary works of drama that were bold, original, and could rival the quality of any other creators in the increasingly diverse artistic market. The Goodman Theatre brought together Kenneth’s former colleagues and friendly rivals. Thomas Wood Stevens (right) originally guided the company in performing a wide array of classics and more traditional dramas along with more experimental work. 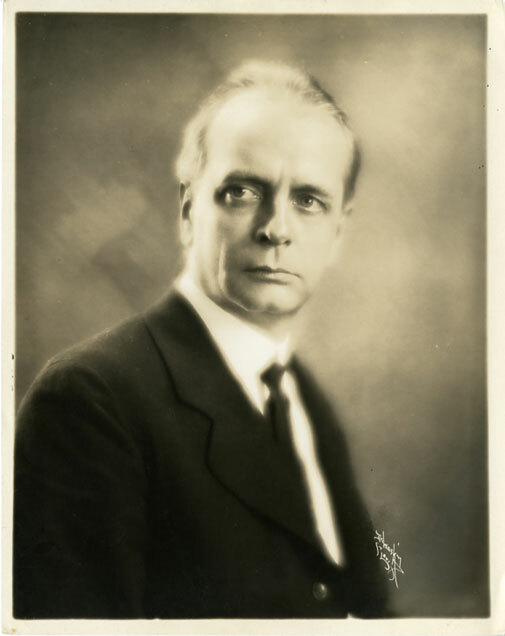 Also taking on directorial duties for several productions was Cloyd Head, a playwright whose work appeared alongside Goodman’s during their days at the Chicago Little Theatre. Images from Head’s play The Grotesques: A Decoration in Black and White come from a Newberry manuscript collections and are subliminally captivating figures. Despite its initial success, the Goodman Theatre underwent financial hardships which eventually resulted in company infighting and both Stevens’s and Head’s resignations. This unfortunate ending to the Goodman’s active role in experimental plays is conveyed through original correspondence, including an unsuccessful membership drive for contributions. “Stagestruck City” is a positive achievement in public history from Chicago’s independent research library. As an avid customer at the Newberry’s Annual Book Fair, this reviewer was unsure if the space used to spirit away books every year could be adequately adapted into gallery space. In fact, the transition was practically flawless with only a few areas of the exhibition feeling cramped, particularly the awkward corner dedicated to the Iroquois Theatre. Most of the space, however, is fastidiously utilized and filled with a diverse array of artifacts from ephemera to playbills to photographs to correspondence. Chicago theater enthusiasts, as well as those interested in Chicago history in general, will most assuredly enjoy this exhibition. More inquisitive visitors might find themselves a bit wanting given the distinctive lack of any active docents at the exhibit. Only three curator-led tours were planned for the length of the exhibition (with the only two remaining being on November 12 at 6 pm and December 12 at 11 am). However, the labeling is elegant and concise, and it serves to reinforce the story already conveyed quite well through the objects alone. Ultimately, should one venture onward to see “Stagestruck City”? Given that it is both extremely well-organized and free, there is no reason why any visitor to the Newberry should not take even a brief trip into the figurative heartland of Chicago’s theatrical heritage. “Stagestruck City” runs until December 31. Additional information on accompanying events can be found here.